China Airlines has transported the national satellite to the US for the fifth time, with its Boeing 747-400 Freighter landing in Miami on 15 April. The Taiwanese airline assisted the National Space Organization by flying the Formosat-7 to Miami Airport, which was then moved to the Kennedy Space Center for launch. Formosat-7 is a weather satellite jointly developed by the US and Taiwan, designed to establish a highly reliable satellite constellation that will continue the radio occultation weather observation mission of Formosat-3. The system will provide a boost to weather forecasting, climate observation and space weather monitoring. The main body and components of the Formosat-7 weighed over 15 tonnes and were packed into nine pallets to ensure maximum shock protection, with the flight plan avoiding all known turbulence. Temperatures were maintained at 20C throughout the journey with shock-absorbing padding to be used during the loading/unloading to minimise the amount of vibration experienced by the satellite. China Airlines says the aircraft complies with rigorous vibration and temperature-control requirements during the taxiing, take-off, cruising and landing. Proud to share with you the professional performance of OPCA member OLA GROUPS LOGISTICS CO., LTD., China. OLA GROUPS LOGISTICS CO., LTD. has recently arranged the loading, lashing and securing survey of 18 units of dumper truck. Considering the discharge at the destination, the customer has specifically asked Ola Group to arrange breakbulk per one vessel and all shipment must have been under-deck. 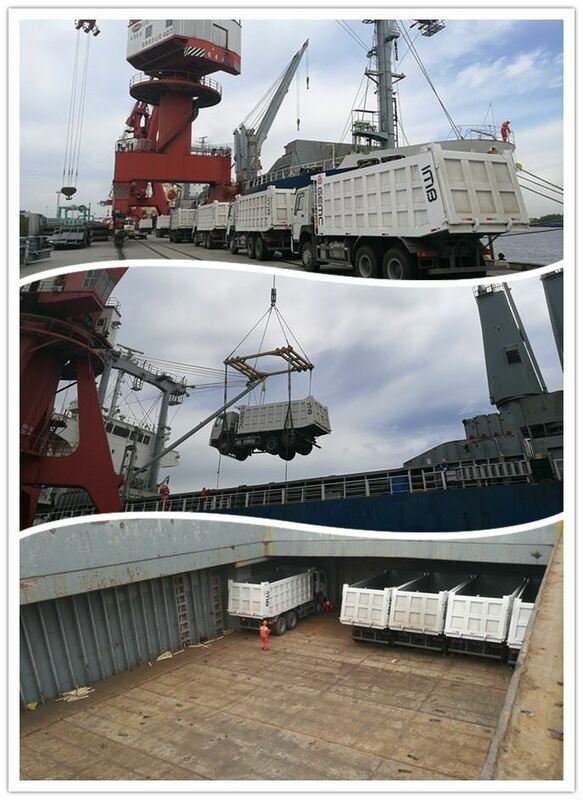 From arrival of the cargo to the loading at Shanghai port, Ola Group team stayed at the port as usual and also on board to carry out the loading, lashing, securing survey. Finally, the cargo was smoothly and safely loaded and stowed. Congratulations to OLA GROUPS LOGISTICS CO., LTD. for their excellent job! Today we are happy to announce you that TITIMAS SHIPPING & TRADING SDN BHD is our new member from MALAYSIA. We are also pleased to announce that Mr. Capt. Richard Gamayao will be attending our upcoming Annual General Meeting in Kuala Lumpur, Malaysia at 28, 29, 30 June 2019. The gathering will be a great opportunity to meet all OPCA members. Please click here for more information about our event. Despite the changing demands of the globalised market, it is their quest to provide world class service through continuous business innovation. With over 35 years of experience in international outbound and inbound cargo shipping in sea containers, they keep their customers informed on delivery schedules and update them on the status of their goods regularly. Titimas’ logistic solutions include barging services, shipping agencies&husbanding, chartering vessel, special project cargo, land transportation, transshipment/trans loading, custom broker, warehousing, bonded/normal trucking, sea freight (FCL/LCL) and air freight, special equipments handling, CFS/inter terminal transfer, door to door delivery, fumigations&CPC inspection, MITI&chamber of commerce (certificate of origin), SIRIM&import permit (temporary certificate of approval). Today we are happy to announce you that WORLD TRANSPORT INTERNATIONAL LTDA. is our new member from CHILE. With over a decade of experience, World Transport Int’l Ltda. has evolved in providing logistic services and transportation of domestic and international cargo up to position itself as a leading company in the Chilean market. Their consultants include full support processes of import and export, letters of credit and financing, logistical support, international physical distribution, trading culture of different countries and even international negotiations and agreements. They know that not all shipments are equal and that there are cases where you need a special coordination so in World Transport, they adapt to any possible situation to offer the perfect solution to your shipments. They manage the shipment of packages, samples and unusual or complex goods anywhere in the world. Their extensive experience in the market allows them to offer all kinds of specialized services, such as refrigerated/freezer containers (fruit, seafood), flexitanks (wine, water, oil), oversized cargo (mining equipment, specialized machinery) and even self-propelled vehicles (cranes, buses, trucks). OPCA valued member FREIGHT PARTNERS INTERNATIONAL INC., Canada referred one of its experienced, reliable and productive partners SHANGHAI FLOWLINK SUPPLY CHAIN MANAGEMENT CO., LTD., China. Today, we are happy to announce you that SHANGHAI FLOWLINK SUPPLY CHAIN MANAGEMENT CO., LTD. is our new member from CHINA. SHANGHAI FLOWLINK SUPPLY CHAIN MANAGEMENT CO., LTD.
Adhering to the guidelines of profession, quality, sincerity, responsibility and flexibility, Shanghai Flowlink Supply Chain Management Co., Ltd. is determined to provide the best logistics solutions for you. For any kind of cargo, oversized or nonstandard, they can help you with the best solutions; they will make sure that your cargo will arrive in destinations timely and safely. They have experienced project transportation team, which can customize reasonable, professional and safe solutions for you; they are not the largest logistics supply chain management company, but they are committed to do their best, and endeavor to create the maximum value for both parties in the logistics partnership; with their profession and experience, they will simplify the whole logistics chain and process, and provide you the best solutions to process cargos from the factory to end-user. Indonesia Maritime Expo (IME) is the most anticipated international event in Indonesia for the world’s maritime players, showcasing the latest in marine, workboat & offshore engineering and port technology. It is where you need to be strengthening your presence, build business alliances and develop potential businesses with Indonesia. Kindly be informed that Hyundai Glovis Lojistik Dis Tic. San. Ve Tic. Ltd. Sti., Turkey switched their OPCA membership from Izmir City to Istanbul City. From now on, they continue OPCA membership with their Istanbul Office. New Member from UNITED ARAB EMIRATES! Today we are happy to announce you that COLLATERAL FZE is our new member from UNITED ARAB EMIRATES. Collateral is a corporation specializing in niche market logistics whose aim is to simplify your transport requirements and optimize your project cost efficiency. They are effectively “the logistics doctors” as they fix your shipping headaches by providing you an assessment of your needs and adequate solutions to solve your transportation issues. They are offering you a blend of competencies able to handle your shipping requirements in difficult environments. Knowing from experience that the average cost of shipping is 7% and 12% (for seafreight and airfreight respectively) of a total project value, the logistic cost impact on your projects is huge and could determine the win or loss of a contract at the bidding stage. Collateral is working closely with you in a fully transparent manner to ensure that the shipping solutions they provide are helping you to win projects. Located in Cote d’Ivoire, Terminal de San Pedro (TSP) is a multipurpose terminal specialising in handling cocoa beans, timber, and transhipment containers. The terminal operates four mobile harbour cranes, reachstackers and terminal tractors and handles around 50,000 TEU year, including refrigerated cargo. TSP has been growing strongly and is now the second largest port in Cote d’Ivoire. In 2011 it handled 1.8Mt of cargo, a figure which increased to 4Mt by 2015, including 3.2Mt of transhipped goods. TSP implemented the OSCAR TOS to increase efficiency and productivity, achieve better data sharing and collaboration, monitor operations in real time and implement a secure billing process. TGI Maritime Software personnel worked closely with TSP over a two week period to configure the TOS to the terminal’s needs, train super users, and support the implementation. “Implementation is the key to success and our proven and robust methodology, partnership approach and thorough training deliver quick and efficient results to optimise container terminal operations,” said Pascal Fasquelle, project manager at TGI Maritime Software.